Max Talent Has a Blast on Air Canada Shoot! Max Agency is a successful model and talent management agency in Canada, representing men, women and children. One of Max’s talents Aisa S. recently had an exciting opportunity to go to Montreal for a photoshoot with Air Canada. Check out what she had to say about the experience below! 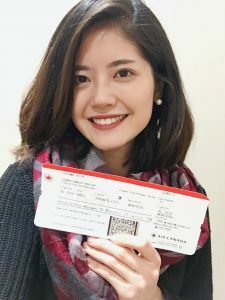 “On December 10th and 11th, I had the privilege of working with Air Canada for their annual photoshoot, and had a wonderful time with their production team as well as other talents and models. I was admittedly nervous as I landed this job through my first audition ever, but MAX Agency and Air Canada’s production team supported me throughout and made sure I was all ready for the shoot. The production team flew me into Montreal, booked me a hotel, and I spent two days at the Air Canada Hangar where they did their shoot. I was nervous on the first day of the photoshoot, but the other models and talents who flew in from all across Canada were so friendly that I was able to befriend them almost instantaneously. We spent two whole days hanging out at the waiting lounge, eating delicious food that was provided, and being on set together. They took photos of us inside a new aircraft, and specifically of me sleeping, interacting with the flight attendants, and relaxing in both business and economy class. On the second day of the shoot, I became a “mom” to a young model for their family shoot, which was a unique experience. The hair & makeup team, producers, and photographers were also very nice, and they helped me feel relaxed on set. I had so much fun with everyone! All of us models became so close during the shoot that we would hangout at the hotel bar after each day, and we exchanged numbers at the end of the shoot so we can keep in touch. We are so proud of Aisa and glad to hear she enjoyed the experience so much! Max Talent Auditioning for Project Training Video! Max Talent Auditioning for Project Black History Month!